Exactly whom did the Cubs acquire from the Rays in yesterday’s eight-player deal? According to most reputable sources, Tampa agreed to send Matt Garza to Chicago, but at least one Windy City newspaper seems to disagree. 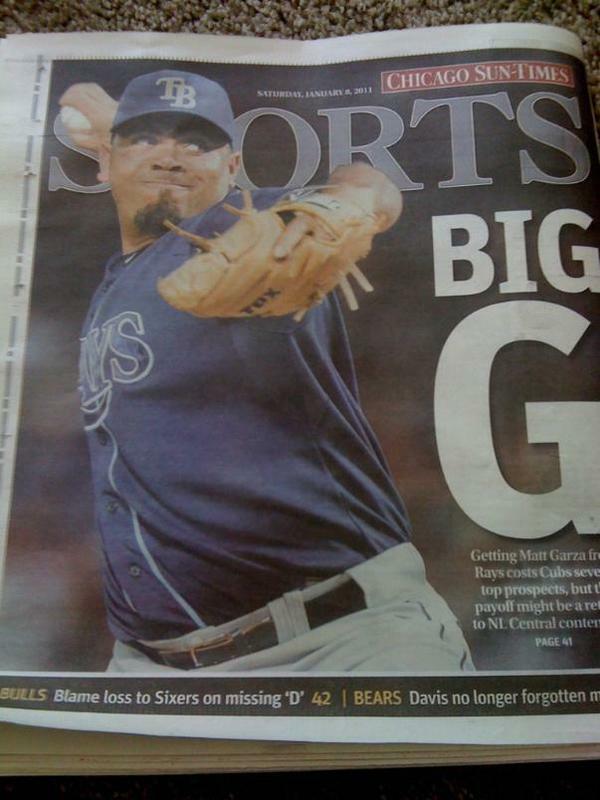 According to the back page of the Chicago Sun-Times (h/t to Rays’ play-by-play man Dave Wills, @SPTimesRays and several retweets on Twitter), the Cubs actually acquired relief pitcher Joaquin Benoit. Talent evaluators around the major leagues had been debating the overall quality of prospects that the Rays received, but in light of this new development, it turns out that Tampa made out like a bandit. You see, Benoit is no longer on the team, having signed a three-year deal with the Tigers back in November. Rays’ GM Andrew Freidman has frequently been cited as one of the best in all of sports, but acquiring five prospects for a player not even on his roster is the ultimate master stroke.